Long before its debut in the Spring, the new keyboard workstation from Korg was already the subject of much speculation. We find out what's really going on inside the OASYS's sleek metal case. As long-time SOS readers will know, Korg created a keyboard called the OASYS (Open Architecture Synthesis System) in the mid-'90s, and the work done on it was used in many subsequent products, such as the Prophecy, Trinity, Z1 physical modelling synth and the Triton workstation. The OASYS keyboard itself was never released, although plans to do so were sufficiently advanced that it was previewed at the Winter NAMM show in January 1995 (an event covered by SOS that March). In early 2000, some of the synthesis technology designed for the original OASYS was released as a computer-dependent PCI card called the OASYS PCI, but this achieved much less success than other OASYS-derived products. In part this was thanks to the demands that the card's super-high-quality synthesis algorithms put on the DSP chips of the day, which reduced the polyphony of the synth engine to just a few notes. 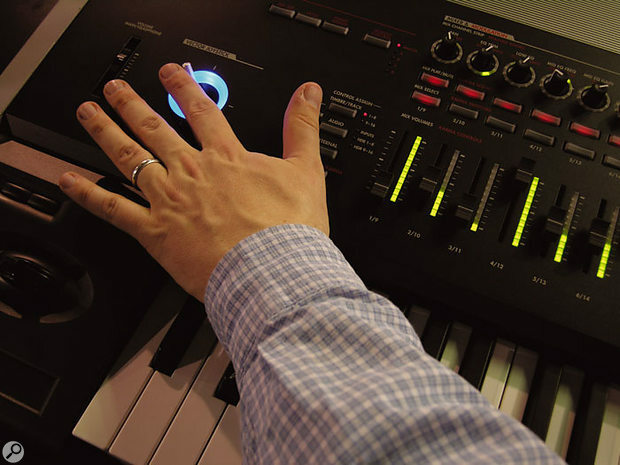 At the 2005 Winter NAMM show in Anaheim, California, Korg finally launched a keyboard bearing the OASYS name. Despite this, the new OASYS is rather different from both of its forerunners, and the acronym now stands for Open Architecture Synthesis Studio. Korg have released products incorporating some of the technologies in the new OASYS before, causing some to speculate that this would be a 'Greatest Hits' synth that simply threw together all of the successful products Korg had made in the past. This is not the case — everything in the OASYS, even the bits which seem familiar, has been developed afresh during the five years it's taken this particular version of the instrument to come together. Korg describe it as a new attempt to implement the same ideas that were at the core of previous OASYS projects. As a prominent member of the US part of the OASYS development team, Jerry Kovarsky, said at the workstation's launch: "The spirit of the original OASYS project was the combining of different technologies for making sound with an open system for expanding that palette of resources. With today's technologies, we're finally able to realise that dream in ways we never imagined back in the '90s." The original Korg OASYS keyboard was never released, although the technology gave rise to several successful products. So what is the new OASYS? Broadly speaking, it resembles the original concept in that the instrument is supplied with a basic complement of technologies — synth engines, sound libraries, and banks of built-in effects — which it will be possible to change and expand later. However, the makeup of these technologies is different from what it would have been in the '90s OASYS. Users will be able to add new synthesis types, effects and sound sets via downloads from Korg, some of which will be free, while others are chargeable. However, despite having at its core a 2.8GHz Pentium 4 processor (running Linux), the OASYS won't support open standards such as VST, and won't run any existing third-party PC software. 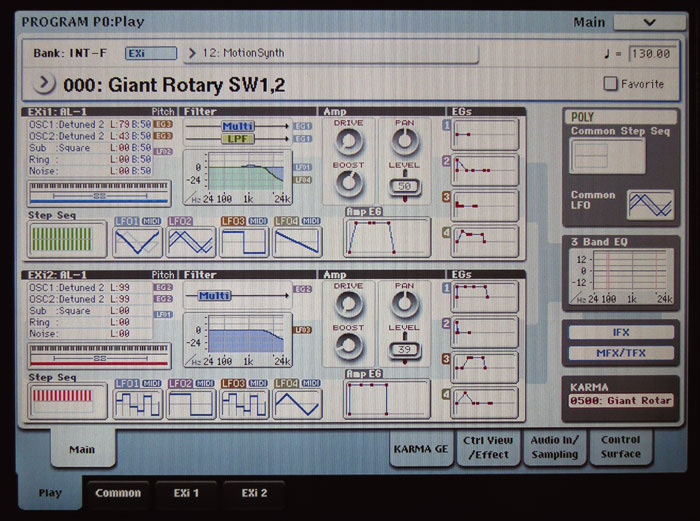 Korg are planning to make it possible for third parties to develop plug-ins for the OASYS, but they have in mind a model more like Digidesign's Pro Tools or the TC Powercore, where the originators of the standard retain control over what's released in order to ensure the stability and quality of the available expansions. The OASYS runs an operating system based on Linux, accessed through a touchscreen. 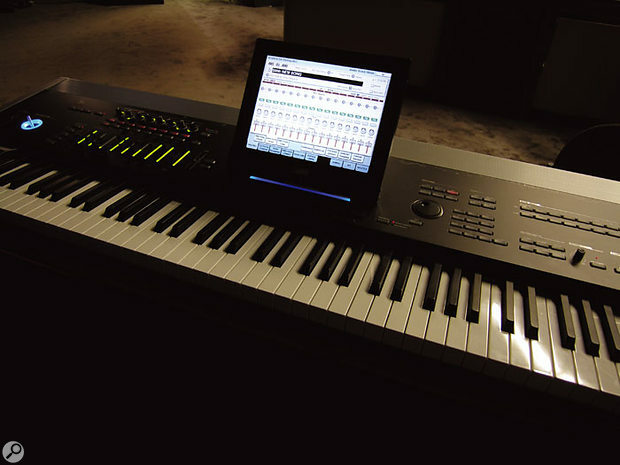 As it ships, the workstation is capable of three different basic synthesis types, hard disk recording, sequencing and algorithmic music generation. It can also act as an expressive, musical hardware control surface. Korg's basic released OASYS specification alone runs to nearly the same number of words as there are in this article, so it's not practical to run through everything here. What we can do is give an overview of its capabilities. In terms of its synthesis capabilities, the OASYS offers a new PCM-based sample and synthesis (S&S) synth engine at its core, the HD1 'High Definition' PCM synth. This is based around 616MB of uncompressed waveform ROM and uses newly developed sample-playback oscillators, which are said to offer ultra-low aliasing and pristine high-frequency response. 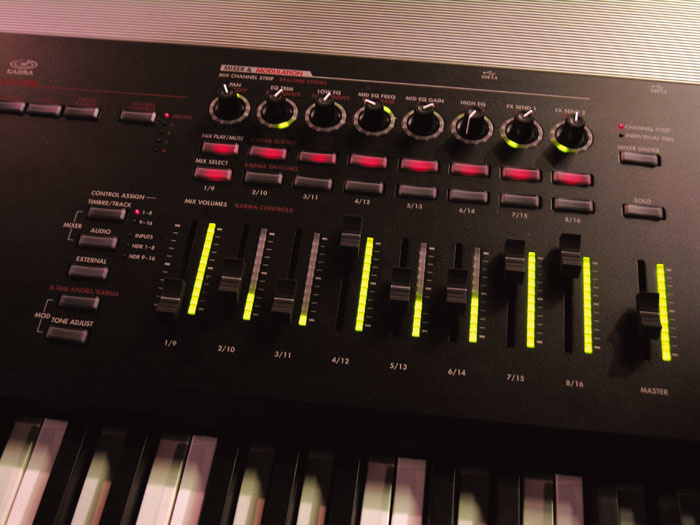 In addition, the HD1 offers wave-sequencing and vector-synthesis capabilities, both of which are substantially more sophisticated than in previous implementations such as the Korg Wavestation. Also built into the OASYS are two EXi Expansion instruments, the AL1 analogue modelling synth and the CX3 modelled tonewheel organ — and more are promised. The HD1 is itself expandable, in that different sample library options (known as EXs expansions) will be available. As supplied, the OASYS comes with two of these pre-loaded: the EXs1 includes, among other things, a number of stereo drum samples, with natural, long decays, while the EXs2 builds upon the 130MB stereo grand piano supplied in the basic ROM, providing longer samples and individual samples for each note. The two EXi options cover familiar territory, but are new implementations which go beyond what Kog have included in previous synths. The AL1 modelled analogue synth features multiple oscillator types, multiple resonant filter types, super-fast envelopes that update every 32 samples (with interpolation), a step sequencer and a vast array of modulation options and routings, to mention just some of its features. The CX3 EXi, meanwhile, is based on an improved version of the engine in the modelled CX3 and BX3 tonewheel organs, and reproduces all the eccentricities of the tonewheel sound, such as key click, percussion, and scanner chorus/vibrato. 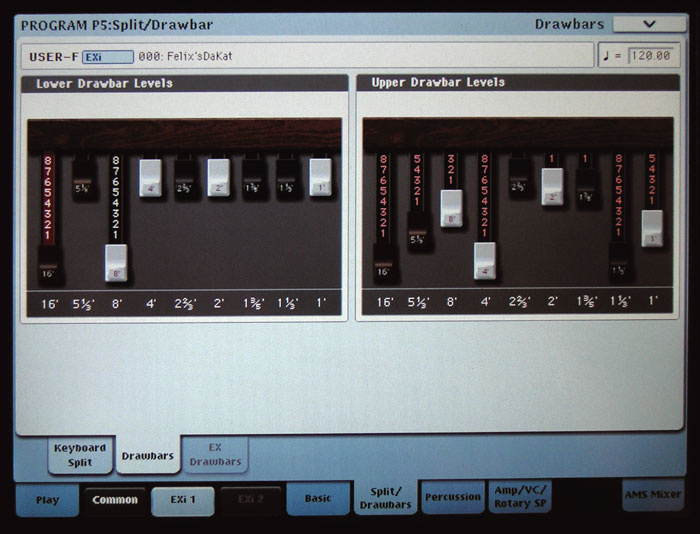 As you'd expect, a complete modelled rotary speaker emulation is also included, and the OASYS's top-panel sliders can be configured as drawbars. 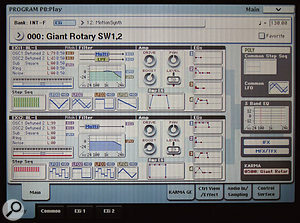 In addition to the power of the basic synth engines, which is evident in the 1152 preloaded Programs and 40 drum kits, the OASYS offers a new effects section, with a complement of 12 possible Insert effects, two Master (send) effects blocks, and two overall ('Total') effects, selectable from nearly 200 algorithm types. Many of these, such as the O-verb from the OASYS PCI card and the Ensemble from the recent Legacy Collection 's Polysix emulation, have been featured on previous Korg products, but they've never been given as much power as this before; there's apparently six times the power of the Triton's effects available here. And powerful as they are, the built-in effects processors will eventually be expandable too; the spec talks of eventual EXf Expansion Effect libraries to add to the EXs libraries. Using the OASYS's Combi mode, up to 16 Programs produced by multiple different synthesis engines may be layered or split across the keyboard. The default voice allocation is 172 voices for the HD1 engine, 84 for the AL1 and 172 for the CX3, so although running effects and the like can reduce polyphony, you're starting from high figures. 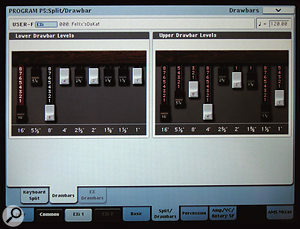 A DSP meter is also included on the effects screen so that you can keep an eye on the amount of processing you're dedicating to the effects. 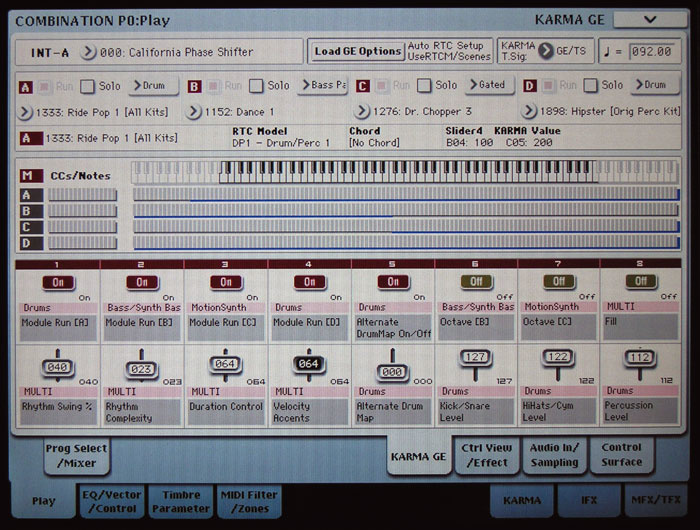 The OASYS also includes the KARMA algorithmic phrase sequencing and arpeggiation technology introduced to the Korg product line in the stand-alone synth of the same name, and available separately for Triton workstations, but once again, this is not merely recycling the old specification. The KARMA implementation, while offering the same powerful ability to reinterpret the timing and pitches of input notes to create new melodies according to rules that you define, has been simplified by the addition of real-time controls for each of its user-defined Generated Effects. And while the arpeggios and strumming-pattern effects this technology produces are as distinctive as ever (and often fiendishly difficult to program without the aid of KARMA), new possibilities are opened up by KARMA Wave Sequencing. This allows KARMA to change the multisamples assigned to a program, creating rhythmic effects similar to wave sequencing. The change of name from the Open Architecture Synthesis System to the Open Architecture Synthesis Studio reflects the addition of technologies similar to, but again surpassing, those of the Triton Studio. 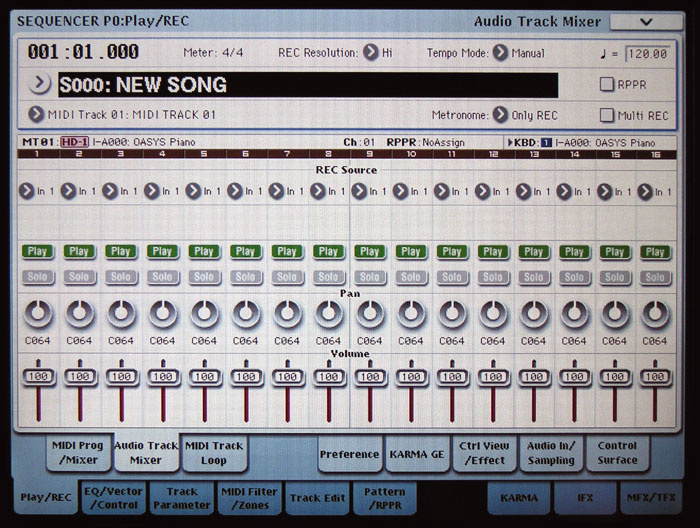 As you would expect of a modern workstation, the OASYS contains a flexible MIDI sequencer and also a well-specified sampler (which uses the Open Sampling System seen on the Triton Studio, with up to 512MB of available RAM depending on what expansion sample sets are also loaded), but it also includes a built-in 16-track 16-bit, 48kHz multitrack recorder with automation and a built-in mixer. Recording takes place to the built-in 40GB hard drive, and finished mixes can be burnt to the internal CD-R/CD-RW drive; alternatively, you can import and export audio as WAV files via the OASYS's USB 2.0 connections. S/PDIF digital I/O is standard, and an eight-channel ADAT optical output is available as a cost option. 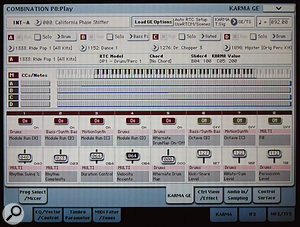 Again, the combination of all these facilities within one instrument should ensure that the whole is greater than the sum of the parts; imagine what you could do applying KARMA to the analogue synth engine, sampling the output internally, and then using the resultant audio as the source material for a completely new S&S sound, or an effects bed on the multitrack recorder. And all these facilities are accessed via the controller-rich top panel of the OASYS, which allows you great potential for expression. There are two joysticks (one, with the illuminated blue ring, clearly designed with vector synthesis in mind), a ribbon controller, and many knobs, buttons and sliders, as well as the usual options for connecting expression pedals. Together, these form an integrated and assignable control surface which can turn your hands to mixing, sound editing and real-time tweaking of synth parameters. If there was any doubt in your mind that Korg regard the OASYS as their new premier, flagship instrument, this should be dispelled by the formats in which it is being sold. There is no 61-note version, just a 76-note synth-action model and a weighted 88-note version. Both retail for around £5000 in the UK and $8000 in the US. Far from replacing the Triton range, in other words, the OASYS sits above the Triton and doesn't affect it, and though its feature set will undoubtedly be tempting, its price could put it out of reach to many potential buyers. Irrespective of what happens to this instrument, however, it's clear that the spin-offs from the new flagship will be with us for several years to come, much as the original OASYS became the progenitor of years of successful Korg products. It's worth sounding a note of measured caution in response to this approach, however. Sales of high-priced keyboard instruments have been falling for years, and some people will point out that they can get an entire PC-based multitrack recording system with modelling instruments and a control surface for less than the cost of the Triton. It's a tough time to be marketing a concept in the hi-tech musical instrument market that seems to be founded on exclusivity, at least in part. There are also a couple of gaps in the super-instrument concept as it's initially being presented by Korg. As yet, there's no disk-streaming technology to permit the use of giant sample libraries, although there's nothing in the OASYS's architecture to prevent such technology being added in a future expansion. 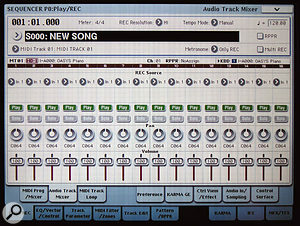 And while the integrated studio facilities and comprehensive I/O are very welcome, and great for those wanting to take a highly produced sound out live, it would have been nice to have some Firewire interfacing options for getting audio to and from a computer in a studio environment. However, if you buy a PC recording system, you buy an empty shell, or at best a shell populated by some pre-installed software components which you have to get to work together. By contrast, the OASYS, like all the best instruments throughout history, from log marimbas to violins, the grand piano and the electric guitar, consists of a system of well-thought-out, complementary components, and should prove to be a lot more than the sum of its parts. With Korg retaining control over the expansions that are available, it should also offer significant advantages over computer systems in terms of stability and consistency. Most important of all, perhaps, is Korg's claim that the OASYS just sounds better than plug-in soft synths and effects. If that's the case, the other points may well seem irrelevant. Look out for a full review of the OASYS in SOS soon. OASYS 76 £4995; OASYS 88 £5199. Prices include VAT.